Leo, a handsome Australian shepherd, came to us from Colorado, where he had been taken in by private rescuers. They saved him after he had been hit by a car and was found on a Pueblo reservation, where a group of boys were beating him with sticks. His legs and hips were deformed and he could not walk. The fosters who took Leo in eventually felt that they could not manage him and decided to put him down. Handicapped Pets (www.handicappedpets.com) then intervened on his behalf. Something about Leo's smiling face and optimistic demeanor captured their hearts. Although they could not help Leo directly, they lobbied to find an alternative to euthanasia, and this led Leo to Home for Life. Leo used a cart when he first arrived at the sanctuary, but with therapy, he has regained mobility and can walk easily without his cart. He is not in pain, but he does tire more quickly than typical dogs his age. Our veterinarians expect that he will likely develop arthritis as he grows older. In the summer, we take Leo swimming in the Apple River to help build his leg and hip muscles; he thinks this is one of the best things that ever happened to him! That, and Leah. 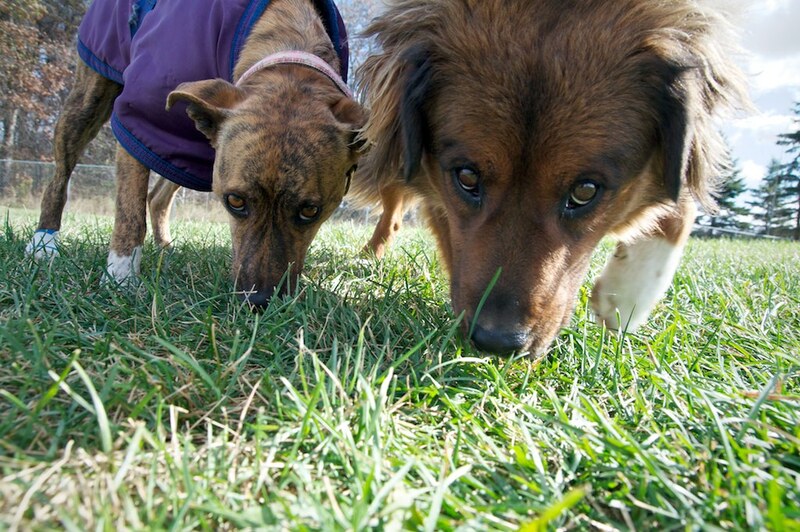 Leah is a sweet brindle mixed-breed dog who was eking out a living on the streets in Mexico. She was rescued by Minneapolis attorney Jim Schwebel and his wife Mary, who help many Mexican street dogs find homes in the U.S. Leah was either born with a spinal deformity or suffered some trauma that resulted in incontinence and a hopping-like gait. For this reason, the Scwebels felt that Home for Life® would be a perfect home for Leah. Leo and Leah have developed a special bond; they love to play together. Looking at photos of their play time, you would never know that either dog is disabled! Both dogs also completed the Renaissance Program in the fall of 2010 and participated in the 2nd Annual Doggone Early Dogwalk with their student trainers from Boys Totem Town. They both did an outstanding job! If you would like to sponsor Leo or Leah, please click here.